A good pair of sun glasses are really important for the protection of your eyes and the skin around your eyes. The UV rays from the sun can cause cataracts, skin cancer around the eyelids, and other eye disorders. After being schooled about the damage the sun can cause I invested in a good pair of sun glasses. In this pic above I am wearing Ray-Ban Wayfarers. Not all sun glasses have good UV protection so its good to invest in a more expensive pair rather than going cheap. A bonus to sun glasses are when you feel tired you can just throw some shades on and feel fabulous! 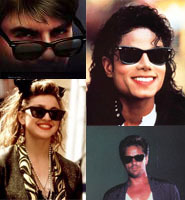 Here is some interesting info I found about the Ray-Ban Wayfarer style from one of my favorite fashion eras the 80s. Ray-Bans are amazing! They are so retro! Also, I feel so cool when I wear them LOL. Check out me in them! You look hot @1393f696865f25c6b28b665b9bd80875:disqus !!! THANKS! you look lovely as well! Those Ray-Bans are ageless. 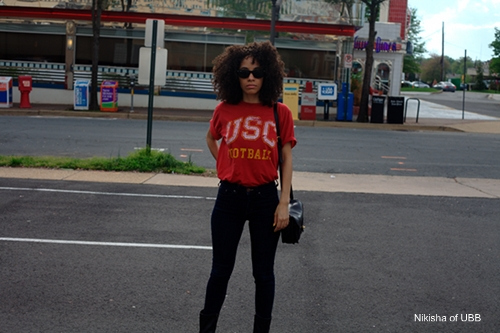 You are looking fierce in them Nikisha. I also need to start wearing sunglasses more consistently. Thanks for the reminder. Ooooh fierce! I like that word, I’ll take it!…lol.Thank you @google-19d49e3b6225e954cbf2205af37613e8:disqus Yeah those UV rays are serious, especially with the continually thinning ozone layer we have. Its important to even wear them when its cloudy! Who is that girl? Lol. I’m a big fan of the Wayfarers. Now if I could just get my hands on a pair of Rayban Clubmasters, my life would be complete! 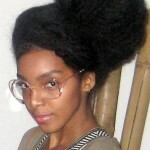 @bettieshambles:disqus I didn’t even know about the clubmasters…now I have to check em out! I do want a brown tortoiseshell pair of Way-farers as well though ;). my head is way too big for ray-bans…they seriously need to make them wider! I absolutely love Wayfarers! I own at least three pairs in different colors. They look very good on my face. It can be very difficult for me to find the perfect pair of shades for my face shape, but Wayfarers always look good on me! These glasses look great on you and I LOVE the picture! That’s a great look with the wayfarers. You can almost never go wrong with wayfarer sunglasses. Some great sites for inspiration. Really i love wayfarers Sunglasses…Thanks for the share! hey this is really impressive and i want to give you thanks for this nice post. As a professional Oakley sunglasses online store, we will provide you with comprehensive Cheap Polarized Oakley Sunglasses. Some Oakley sunglasses are Polarized Oakley Sunglasses, and some are Women Oakley Sunglasses. This shop also offer Cheap Oakley Sunglasses Sale and Oakley Sunglasses Sale. No matter what product you need, we will provide high quality and competitive price. If you have any questions. Please feel free to contact us, we will be patient to answer your questions! You are rocking that sunglasses girl. Not all women could pull that off. But you totally look good on that. Ray Ban Wayfarers are great high quality Italian sunglasses. They’ve been popular for so many years and still are. Didn’t know that the sun could cause the damage even to the skin around the eyes. Ray-Ban seems cool, I should give it a try too!